Here’s my Concord Monitor opinion piece from yesterday. It’s odd how Common Core opponents assert that teachers don’t really understand the evils of the new standards that raise expectations for our students, even as they use them every day in their classrooms. Sue Hannan, 6th and 7th grade teacher at Manchester’s Hillside Middle School: We need to set that higher standard. The Common Core does that. November 25, 2013 5:20 pm / 2 Comments on Sue Hannan, 6th and 7th grade teacher at Manchester’s Hillside Middle School: We need to set that higher standard. The Common Core does that. Sue Hannan, a 25 year teacher, taught in a great special reading program until it was lost to the budget cut. 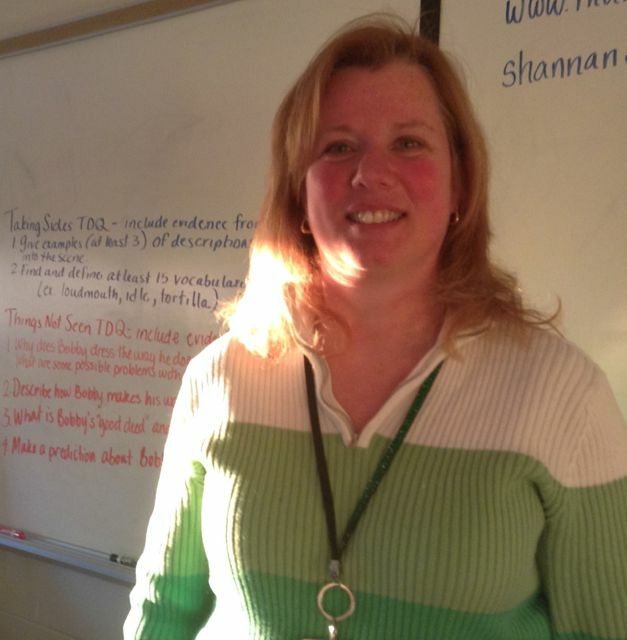 Now she teaches 6th and 7th grades at Manchester’s Hillside Middle School. What’s the status of the Common Core in Manchester classrooms? What got you started down the Common Core road? Do the new standards raise expectations? “In the past, schools let it slide when a parent said, ‘My student can do this or can’t do that.’ The educational community became fearful of raising expectations. But that’s where we’ve been failing. We need to set that higher standard. The Common Core does that. How does teaching to the Common Core compare to teaching in the No Child Left Behind era? What about algebra in the 8th grade? “My child needs to be challenged more. My child needs to work harder and do better.” Isn’t it every parent’s goal for their child does better than they did? And if we’re providing something that’s going to help them be better, why oppose it? At the NEA-NH fall professional development day in Bow, NH, Susan Martin talks about demands the new standards make on kindergarteners. We have just put in an all-day Kindergarten – plus we were charged with doing Common Core from the get-go – so we spent weeks doing this in terms of just setting up all the logistics behind it and determining how we were going to assess…. It was a huge commitment…I have to say,…I’ve probably increased my time by 25%…, but I think it’s getting less…. I’m just more familiar with the standards and what we’re looking at so that anxiety has decreased. …The interesting impact is what parents say. They immediately recognize that it is more rigorous and that we are asking a tremendous amount, and at the Kindergarten level it is phenomenally hard. It’s like 1st grade stuff, and that’s what people will say. And most people are welcoming of it, not everybody accomplishes it…There’s less play but there’s still play. …we recognize that the Common Core are standards; they’re not the curriculum. We’re still charged with implementing those standards through a curriculum. So if I can figure out a way of doing it in a playful way and I’m reaching those, those standards, it’s fine. It’s great. ….this may sound weird but I think we’ve been doing Common Core for at least the 20 years that I’ve been [at Lebanon High School]. To me it’s just good curriculum and good classroom instruction….I for one have been teaching an American Studies program for 21 years where it’s American literature and American history combined together. We bring in philosophy. We bring in economics. We bring in art. We bring in music. And when you have all of these things put together….right embedded in the curriculum, they are the higher order thinking skills I think the Common Core really addresses on a number of fronts. So I’m a believer. Here is Richard Kirby, who teaches 6th grade math and social studies at Alton Central School, the single school in the Alton school district recently famous for voting to “reject” the Common Core. A second Alton teacher chimes in at the end. I’m Richard Kirby and I teach at Alton Central School…We’re supported by our Superintendent and by the Principal, but the School Board are the ones who are missing the point. …And they don’t know…we’ve been working on the Common Core for a few years …, putting everything together. …the Common Core just clarifies things. It makes it easier for me as a teacher. Kathy Kirby, Hollis/Brookline High social studies teacher: more primary source material – fewer text books. November 24, 2013 12:39 pm / 2 Comments on Kathy Kirby, Hollis/Brookline High social studies teacher: more primary source material – fewer text books. Here is Kathy Kirby, social studies teacher at Hollis/Brookline Cooperative High School, talking to 50 teachers in a Common Core town hall meeting on October 16, 2013, during an NEA-NH professional development day. How is your classroom actually different as a result of implementing the Common Core? Diane Johnson spoke about her Common Core experience at a town hall meeting held on October 11, 2013 at the NEA-NH professional development day at Bow High School. I’ve been working with the Common Core for a couple of years now and the thing that I’m finding with my first and second grade kids is it’s less and more, all at the same time….. And they’re rising to the occasion. They’re thinking harder about fewer things and they are gaining a broader perspective, number one. …The standards are higher than they were but we’re doing fewer things. MANCHESTER — The 19 first-graders gathered for reading class with teacher Amy Villeneuve at Gossler Park Elementary School were excited to have visitors and anxious for the reading to begin, but first they had to answer some questions. “What kind of stories have we been reading?” Villeneuve asked. It took some coaching, but the class soon established that every narrative has to have a beginning, a middle and an end. “What are some of the words we can use to show beginning, middle and end,” Villeneuve continued. Hands shot up, with students providing the answers: first, next, then and finally. And so Villeneuve began to read the story, titled “It’s Mine,” about a pond full of frogs who told a visiting toad to get lost, only to find themselves swamped in a flood and stuck on a rock, which turned out to be the back of the toad. They agreed to share the pond. Afterward, each student had to produce what could be considered a first-grade book report, in which they had to say what happened at the beginning, middle and end of the story. Some used words; some drew pictures; each took a turn presenting to the class. If you think first grade is too early to start learning the basic structure of a narrative and applying it in your own writing, think again. read the rest at Manchester opts for own standards.